I am writing while watching snowflakes fall outside. I know it’s early March, but winter is welcome to take its leave any time. I want to feel the warm sun on my face and lose the down coats. Don’t get me wrong because I do love the cold weather and all that goes along with it. But there comes a time during the season when I know I need a change, pronto. Update – I am editing while looking at tons of thick, heavy snow that has fallen overnight. One of our trees fell and broke a section of fence that surrounds our yard. Winter, you are officially exhausting me now. We need to break up. About a year ago, I was developing a recipe using quinoa as the main ingredient in a risotto style dish. A complete protein and high in fiber and antioxidants, quinoa is a great choice to bump up the nutritional value of a “risotto” as I am calling this recipe. It doesn’t have the same toothsome quality of an arborio rice, but it is healthier and lighter than the traditional risotto which I appreciate as we look ahead to warmer weather. Anyway, I developed the recipe and had three friends kitchen test it for me. They all loved it, and then for some reason that is still a mystery to me, I proceeded to abandon it! Recently, I was scrolling through my photos to free up some space on my phone when I came across the pictures I had taken of my first attempt at the dish a year ago. I decided it was time to get that recipe retested, photographed and on the blog. The original recipe called for zucchini which I cooked in a pan alongside the shrimp. But, we are not in zucchini season so I experimented using asparagus, a comment one of my testers suggested might be a fun swap out for the zucchini. It worked very well and since asparagus season will be here before the local zucchini, a natural fit. The dish takes no time to make. Saute an onion or a leek in some butter. Add garlic and then toast your rinsed quinoa in the pan for a minute or so. Add low sodium chicken or vegetable stock and simmer, adding the asparagus spears about half way through the cooking time. In a separate pan, heat some additional butter and cook the shrimp until just pink. Once the quinoa is cooked, fluff it with a fork, add some lemon zest, parmesan cheese and parsley. A splash of half & half is a nice indulgence but not necessary. 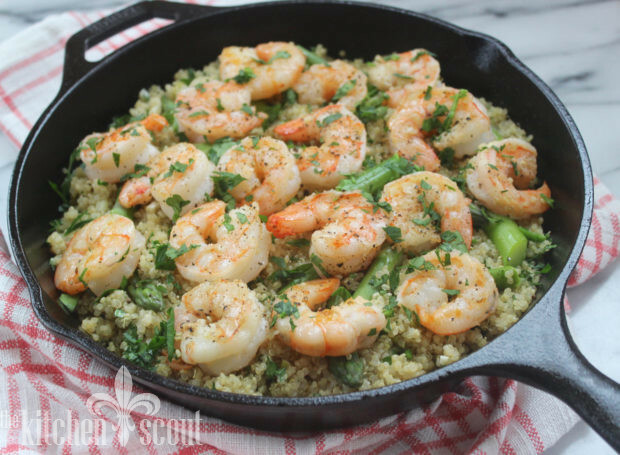 Top the quinoa with the shrimp and some additional salt, pepper and parsley to taste and serve. Doesn’t that sound like something you should make this weekend? I served it to some girlfriends this week, alongside a spiced basmati rice salad with cauliflower and pomegranate seeds from America’s Test Kitchen and a green salad with mango, avocado and red onion. Thanks to my friends and testers, Ellen, Deedo and Ellen (yes, two Ellens!). 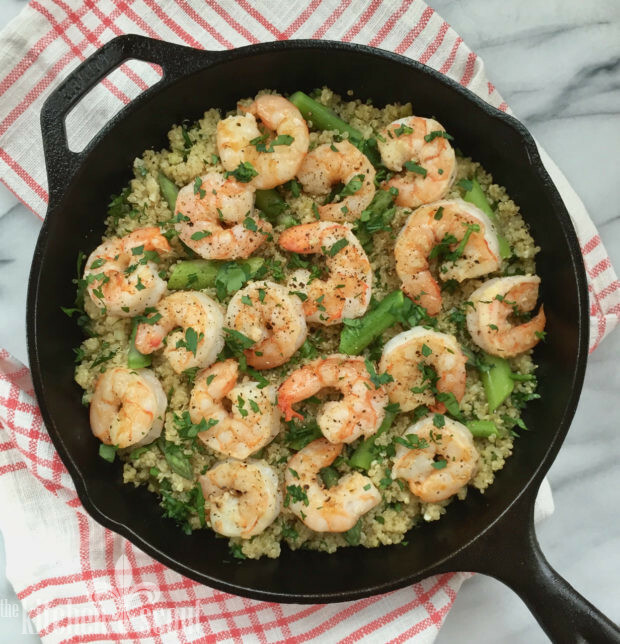 If you make my Quinoa “Risotto” with Shrimp and Asparagus, please comment below and let me know how it came out! In other news, I was featured on The Bookmarkk’s Instagram account (yes, two k’s!) where I share some of my favorite things. You can check that out here. In a large sauté pan, melt 2 Tablespoons of the butter or ghee over medium heat. Add the onion and sprinkle with a little bit of salt and pepper. Saute the onion until translucent. Add the garlic and sauté for another minute. Add the rinsed quinoa and stir constantly until the quinoa is toasted, another minute or so. Add all of the broth to the pan and bring to a boil. Turn the heat down and cover the pot, simmering the quinoa for about 7 minutes. Add the asparagus and continue simmering, covered for another 5-7 minutes until most of the liquid has evaporated (see note below). Depending on the size of your pan, this could take up to 15-16 minutes. While the quinoa is cooking, melt the remaining 2 Tablespoons of ghee or butter in another sauté pan. Sprinkle the shrimp with some kosher salt and pepper and add to the pan. Cook for 2 minutes and flip and continue cooking for another 2 minutes just until the shrimp is pink. To finish the risotto, fluff the quinoa with a fork and add the parmesan, lemon zest and parsley, stirring to combine. Add the splash of half & half if you want it a little creamier. Taste and correct for seasoning with salt and pepper. Depending on the thickness of the asparagus, you may want to adjust when you add it to the pan. Really thin asparagus will cook in no time so you would add that to the pan with about 3 minutes remaining for the entire cooking time. Val – Can I substitute whole wheat Israeli couscous for the quinoa? Yes, you may just need to adjust the cooking time a bit. I think it would be delicious (although not as nutritious) with the Israeli couscous! Looks yummy. I think I’ll make it for Arpi and Melkon this weekend. Thanks for sharing!